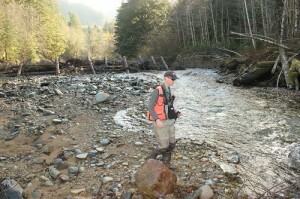 Eric Marks, salmon biologist for the Puyallup Tribe of Indians, conducts a spawning survey downstream from a new logjam. The Puyallup Tribe of Indians is already finding salmon using newly restored habitat on the Clearwater River. So far this year, the tribe has counted more than 100 chinook and 250 coho in about a mile of restored river. The project was managed by the South Puget Sound Salmon Enhancement Group (SPSSEG). Last summer a total of 18 large and small engineered logjams were installed in the Clearwater River about two miles up from where it joins the White River. Placement of these log jams will reconnect flows to a network of 11 existing side channels, dissipate floods, and increase instream structure and cover in the river. “Adding the wood and instream structure to the river will encourage the river to move and create habitat in a way it always had,” said Kristin Williamson, SPSSEG project manager. The Puyallup Tribe conducts extensive spawning surveys throughout the Clearwater for chinook, coho and pink salmon. Data from spawning surveys help natural managers assess the success of habitat projects. Fisheries managers also use the data to help build future salmon fisheries. Just downstream from the project site the tribe also recently built a new juvenile chinook acclimation pond. The Puyallup Tribe annually transfers as many as 800,000 juvenile spring chinook from either a state or Muckleshoot tribal hatchery and raises them in several acclimation ponds in the upper White. This entry was posted in Environment, Local News and tagged habitat, Puyallup Tribe, salmon, tracking by Kim Kalliber. Bookmark the permalink.